Stamford Talk: Eat, Think, Drive, Blog! : Can Someone Confirm That I Saw a Dead Pig? Can Someone Confirm That I Saw a Dead Pig? I just saw something really, really odd on the Merritt. It's 10 pm and I just got home from visiting a friend in Westchester. Just before exit 34, I swear, I saw, lying dead on the right side of the road, a huge pig. It was white and grey, and a tiny bit hairy. It was not a deer. I don't think it was a dog, because it was big. Like, me-sized. It looked like it had a snout, but the head was thrown back, so I was only looking at the underside of its chin. What I mean is, I did not get a great look at this animal as I was speeding by at 60 mph, but I really think it was a huge pig. 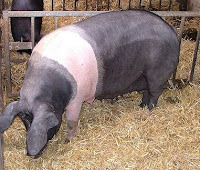 It looked sort of like this pig, but it was lighter grey. I share this info in hopes that someone else saw the creature, or knows someone who saw the creature. It's not unreasonable that a pig could have escaped from a farm-ish place near the Merritt. I feel bad about the dead pig. I really think it was a pig. You are sure it wasn't a small deer? Perhaps a large porcupine or a possum? I have seen several possum dead on the Merritt. I only ask because a human-sized pig is rather large....perhaps a boar but I don't think they are indigent to the FC. I cannot confirm or deny if you saw a pig but I just wanted to say that I really enjoyed this post. I saw a coyote by the river at the start of Washington Boulevard on Tuesday morning (8.30am), although the missus swears it was a wolf. Surely she must be wrong? It's very likely it was a coyote. I've seen quite a few of them around here. OMG I saw it too while driving home last night around 9:30. No idea what it is but could it be the Montauk monster? There is / used to be a home between exits 34 and 35, south of the parkway, where someone kept livestock. More like llamas, though, if I am not mistaken. Not necessarily giant wild boars. Any chance you took a wrong term and ended up on the set of LOST? It really had to have been a huge pig. When I say me-sized, I mean, around 150 pounds. I'm looking at my 50 pound coonhound right now, and what I saw was definitely at least 3 times her size. OMG the Pigsquatch comment is the best! K- Will ask the firemen up here...there should be a report with the city or animal control...Im delivering pies later and will report back. Its very possible in that people do have farm animals up here...Pigs are smarter than dogs, y'know, and even though their poo smells bad, they are not dirty unless you pen them in mud! I only eat pork that has lived in a field and had a good life, but maybe we shoulda gone down and dragged the sucker to the butcher, what with meat prices and all! I was at a Halloween party north of here and found myself sitting in a very wooded area around a fire pit next to a local guy who actually was looking for someplace to raise a couple of pigs for butchering. I have land, so...but NO! Because I really like pigs...alive! This is why I love Stamford! New Layla's in Stamford: Falafal and Liquor! Could Rampaging Turkeys Happen in Stamford? Let's Get Rid of These Leaves! Me on Sabatiello's, in Newsprint: Is It OK? Thursday TV: Stamford on Kitchen Nightmares! CRUMBS: Not Impressing Me Yet! I Voted! I’m Sick! I’m Taking a Trip! Does the Advocate Also Endorse Palin?